Looking for a cozy place with affordable price? 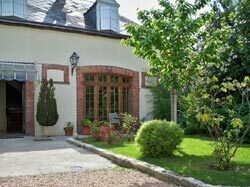 Chartres bed and breakfast could the best option for you! 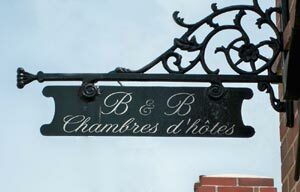 Bed and breakfast or chambre d'hôtes offers hotel like services and usually less expensive than hotels. You could have a vacation with a "feel like home" ambiance. Your host will always be happy to share their experience and guides to visit Chartres as a complementary service to their guests. Where can you find Chartres bed and breakfast? This type of lodging could be located in the city center, periphery and rural areas. If you love to stay close to almost all facilities like commercial and shopping center, tourist spots etc... location in Chartres center or even in periphery could be good to look for. While those in rural areas are the best choice if you love living in a country side. La Maison de la Cathedrale has a quite strategical place - at the feet of the cathedral! Has 5 spacious rooms (about 25m²)with a name for each: Bleue, les Lois, Penelope, Henri IV and les Anges. No elevator on this 4 levels building, so don't hesitate to ask help to the staffs carrying your luggage upstairs! All rooms are no-smoking room, air conditioned, a satellite television and wi-fi. Your pets are welcome. You can enjoy the Jazz Night every Friday and Saturday night at their on-site restaurant - Le Parvis. 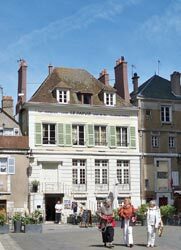 An independent French house typical with a courtyard, next to the host's resident - situated in a quite neighborhood in the center of Chartres. About 10 minutes to Chartres cathedral. This could be the best choice if you love a quite place with countryside ambiance but still close to almost everything. 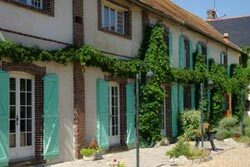 Clos Chedeville is a comfortable house with a terrace and a green garden. Madame Chedeville Françoise will welcome you as the host. Located only 500m away from the cathedral, open all year and welcome up to 2 guests in a 20m² room with a private entry. Amenities include television with DVD player, wi-fi, mini refrigerator, microwave, toaster and in-room coffeemaker. French breakfast is served at the house lounge at your favorite hour. Secure parking is available in a closed property. Good news for smokers... smoking permitted in Clos Chedeville. This is a pet-friendly bed and breakfast. From 55€ - additional 10€ for each supplementary person. La Villa Saint Pierre, owned by LE LAN Nolwenn, sits on a historic neighborhood - only few steps away from the Nôtre-Dame de Chartres, Saint Pierre Church and Parc des Bords de L'Eure. Recently renovated and welcome up to 5 guests in 2 non-smoking rooms - Evasion and Suite room. Rooms are equipped with television, CD/DVD player and wi-fi. You can pamper yourself in the relaxing room with jacuzzi, tropical shower or massage sessions on demand. French breakfast can be served in breakfast room or on the patio. For your daily meal - you will have the convenience of a fully equipped kitchen with refrigerator and microwave as well. 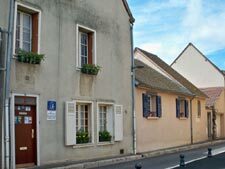 Les Conviv'hôtes sits in the old city of Chartres... just a walk away to Chartres cathedral and the Eure river. This bed and breakfast is hosted by Menard Sylvie and Fabrice. Has two rooms with private bathroom - Blue room with a city live nuance decoration and Yellow room with a countryside decoration theme. All rooms are designed for 2 guests. Copious breakfast in the kitchenette, private parking for car and bicycle, in-room television and wi-fi. Pets and smoking are not allowed. 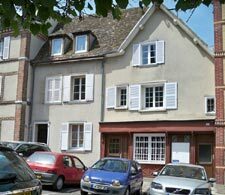 Charming and comfortable wooden house in a quiet area in Le Coudray - only 5 minutes by car from the heart of Chartres. Bezine Marie-Christine will be your host. Welcome guests in 3 rooms - Chocolatine with direct access to terace, Pomme d'Epice with over look to garden and Belle Cannelle with a small lounge. Amenities include kitchenette, private bathroom and internet connection by wi-fi, breakfast served on terrace or garden, bike rental available on-site. Smoking and pets are not allowed. Approximately 21 km from Chartres - a lovely farmhouse of 19th century with a large garden. 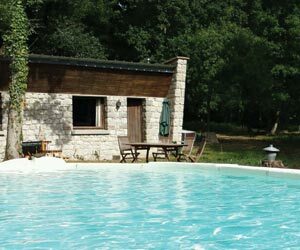 Les Chandelles has 3 double rooms and 2 family rooms with private entrance and a cozy lounge, free secure parking, a spacious farmhouse kitchen. The house is open all years. Amenities include private bathroom and WC, internet connection by Wifi, continental breakfast served in the kitchen, possible supplementary bed for junior on request. Smoking and pets are not allowed. Reservation at the last minute is possible (depends on the availability rooms). An authentic Hunting Lodge in the middle of a 30 ha estate, located at 25 km from Chartres and at 100 km from Paris. The stone house of 80 m2 with well-kept decorations, a subtle mixture of traditional British hunting Lodge and middle age castle atmospheres, has a Chesterfield sofa, an old tapestry and crystal chandeliers. Amenities include a TV set, internet access, an authentic fireplace, a private 10m x 15m swimming pool, kitchen with fridge-freezer, oven, gas cooker, a Nespresso coffee machine and a dishwasher. The shower bathroom, steam bath and balneotherapy or its designed bathtub allow to perfect your relaxation. Massage service is available on request. Hunting and fishing activities are not included in the accommodation price but can be arranged on request. The maximum occupancy is for 2 people, a child or a baby bed is available on request. Smoking and pets are not allowed. The house opens all year.